One of the most iconic guitars - and one of the most popular - over the last 40+ years has been the Gibson Les Paul. It's thick, beefy body lent itself to both Blues and Rock styles with a thick, beefy sound. Guitarists such as Jimmy Page, Ace Frehley, Brian Robertson, Scott Gorham, and Randy Rhoads became well known for their use of the Les Paul. But the Les Paul was always an expensive guitar, so other companies started copying the classic Gibson. In the mid 1970's Gibson sued some of these companies for trademark infringement. 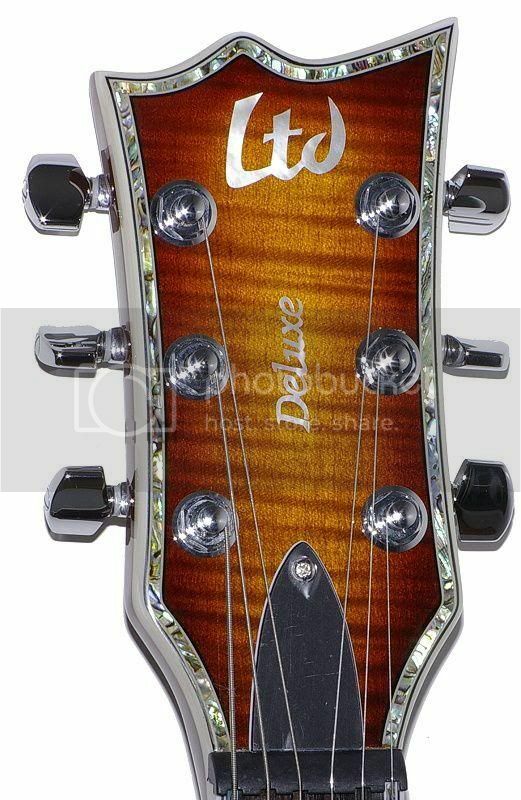 Not for the guitar shape or specs, but for the headstock design, of all things. So many of these companies came up with their own variations on the Les Paul, and many of these guitars were arguably just as good as the classic Gibson design. On this thread we'll discuss some of these gutars. Starting with the Ibanez Artist. In the mid 1970's Ibanez transitioned from largely making copies of other companies guitar designs to creating their own. Their Les Paul copies were considered to be among the best of the copies, but their Artist series would top their Les Paul copies. The first, and most drastic, change to the design was to make it a double cutaway. This gave greater access to the upper frets and gave the guitar it's own look and feel. Ibanez had struck gold. The 2619 was their signature model (there were variations, the 2618, 2617, etc). Beyond the double cutaway design it also departed from the standard Les Paul in that it was thinner and lighter. 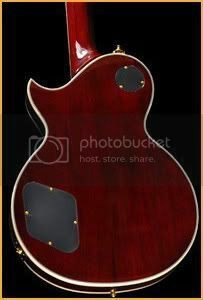 Not a lot lighter, but enough that it was appealing to players who got tired of lugging around such a big hunk of wood that was the Les Paul. The attention to detail was also amazing. Abalone binding for a year, with block abalone/mother of pearl inlays throughout the run (for the 2619's and later the AR300's). The entire guitar was a beauty - and extremely well made. In 1980, though, Ibanez decided to change the design of their Artist series and with it came a name change. The 2619 became the AR300. And the body became just as thick as a Gibson Les Paul. The change was accepted and even welcomed by many. The sound was just a tad fatter and fuller, and the guitars remained fairly popular. 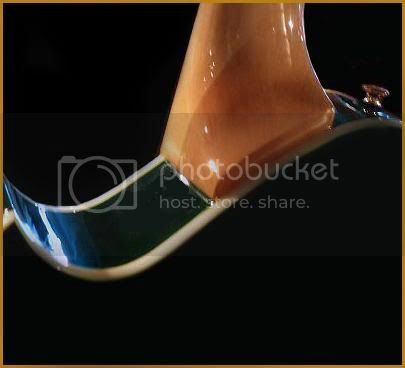 They also added multiple finishes that were previously unavailable. Black, Cherry Sunburst, even a Marine Blue model. 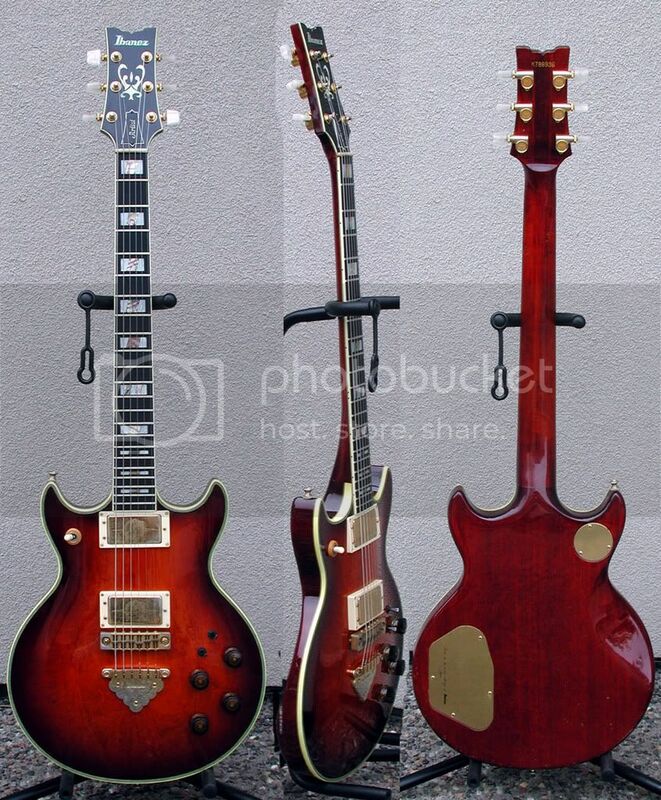 While the Ibanez Artist series never reached the level of popularity that the Gibsons got they have remained popular and well respected (and now fairly collectible) guitars. The sound is fantastic, and the look and feel of the Artist series equalled or surpassed the model that inspired it. Up next, the ESP Eclipse. 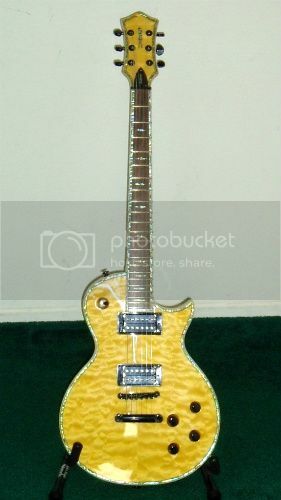 Introduced in 1995, ESP's variation on the Les Paul features a thinner body than it's Gibson counterpart, and a slightly different body design (a shorter lower, "Horn"). Like the Ibanez Artists, the ESP Eclipse series is largely a set neck guitar with a mahogany back and maple top. It is noticeably lighter than the Les Paul. The hardware can vary, with the biggest options being the active EMG pickups or the standard Seymour Duncan pickups. 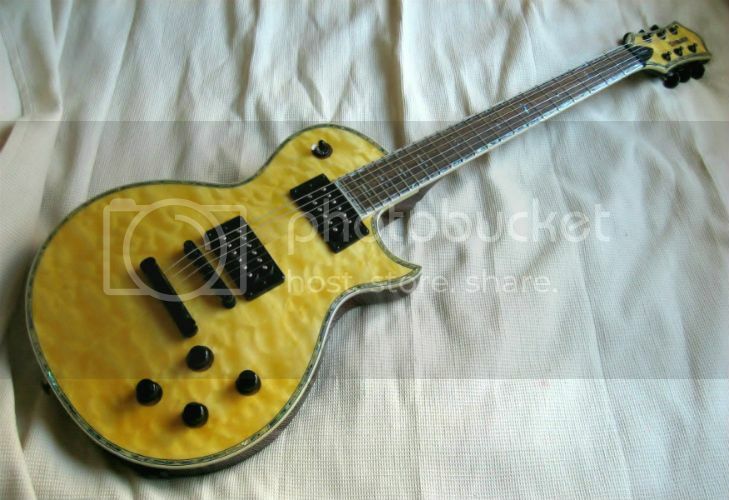 ESP has also made Eclipse style guitars under their LTD name, calling those models the EC series. The EC1000 is actually loaded with more visual frills than it's ESP counterpart (with abalone binding on both the body and the neck/headstock, and abalone inlays). Another manufacturer that put out a nice customized/modified Les Paul type was (and still is) Aria Pro II (now largely streamlined to just "Aria"). 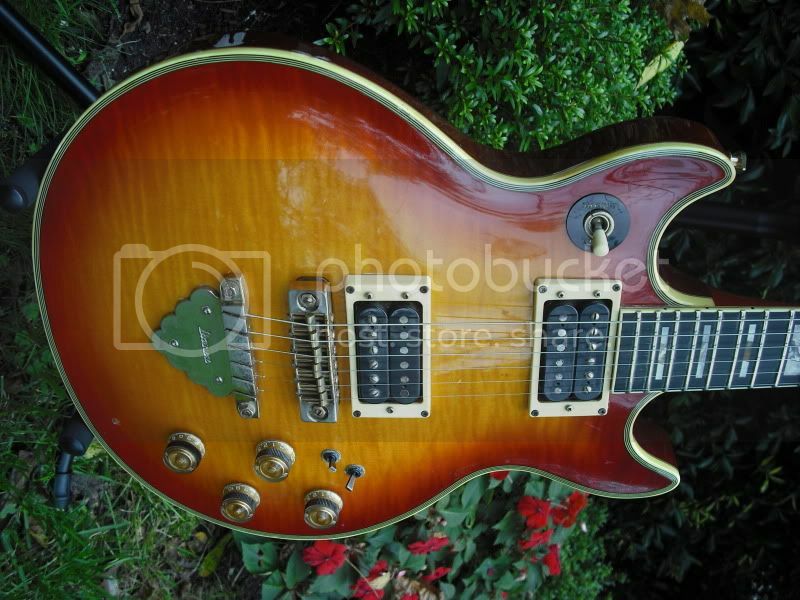 Like Ibanez, Aria had made Les Paul knockoffs that were solid, well made guitars. And like Ibanez, Aria decided to come up with their own design. The PE series had some revolutionary changes to the Les Paul design, most notably the smooth "Heel-less," kneck/body joint. This design gave the player greater access to the higher frets. The guitars were very well made and had great tone. Neal Schon of Journey and Mike Pinera (of Alice Cooper's band) used the PE models in the early 80's. The PE models sold fairly well, but never had a big impact on the market. 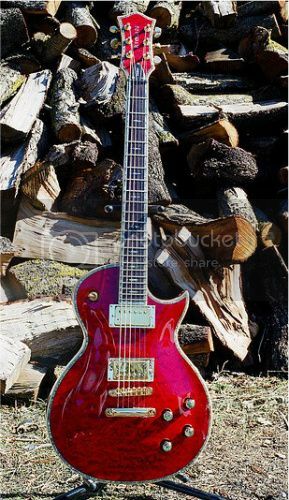 Recently, Aria got back into the PE business and have put out some very nice looking guitars. Aria also made a lot of other models, all of higher quality than a lot of people believed. The Matsumoku made Aria's are all very, very good and were sold at fairly low prices (the vintage Ariaa are going for more now, of course, but still not as much as a Gibson or a Fender). A newer entry into the market is Carparelli guitars. The design that they have that is the most striking is the S4 - which is right in between the classic Les Paul and the PE models from Aria. 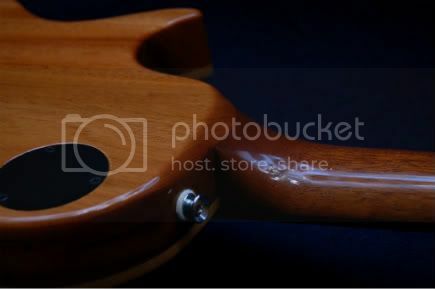 Some of the body shape (particularly the heel) is similar to the Aria PE's, but the neck joint looks more like a Gibson in how the neck meets the body. It really is a hybrid of the two - and a very nice guitar. Carparelli S4's come in a lot of finishes with a lot of different features, from a Bigsby to a Floyd Rose you can find a lot of different features available on a Carparelli. They also come with really nice abalone binding and look very sharp. Mick Box of Uriah Heep is one of their endorsers - and he loves their guitars. Carvin got into the Les Paul business, more or less, with their California Single line (CS series). These are some very well made guitars with a lot of attention paid to the details. They look great, they feel great, and they've got some nice design variations from the standard Gibsons. The bridge is flush with the wood, so the action can be lower and the bridge won't bend one way or the other because you don't have to worry about the poles getting bent. The heel has a smoother design than a Les Paul (somewhere between the old Ibanez 2619 and the traditional Les Paul), but it still isn't quite as, "Heel-less," as the Aria Pro II's. Still, it's an improvement on the original Gibson design, and the Carvins overall are very, very good. Peavey has some Les Paul styled guitars as well. These are very low priced guitars made in China - the SC series. The SC2's and SC3's are set neck guitars, but the SC1's have bolt on necks. They look fairly nice, and the price point is certianly right. The SC3's have 3 pickups and come in black or white. The SC2's come in cherry sunburst, brown burst, and black. The SC2's come with chrome hardware, and the SC3's have gold. As noted they are made in China so your mileage may vary. Like Japan and then Korea before them the Chinese get a bad rap. The Japanese proved to be excellent guitar manufacturers, and the Koreans are starting to prove the same. Only time will tell as to the quality of guitars made in China. 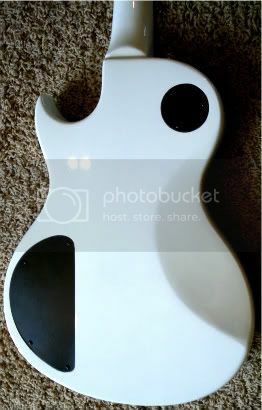 They look great if you're on a limited budget and want a set-neck Les Paul styled guitar. Perhaps the Holy Grail of the Les Paul types is one made under the auspices of Gibson itself. Several years ago Gibson bought what was left of Kramer guitars, and they continued to build the same type of guitars that Kramer had been known for throughout the 80's and early 90's. 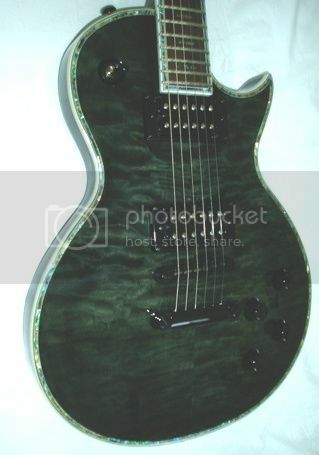 But then, in the mid 2000's, Gibson decided to use Kramer to go after a major competitor to the Gibson Les Paul line. They targeted ESP's LTD line of Eclipse (EC) guitars. ESP's LTD EC series was known for high quality and stunning good looks. The LTD EC guitars were actually more more lavish looking than the actual ESP Eclipse guitars. Pronounced flame and quilt tops, stunning colors, and in some cases abalone binding around the entire guitar (neck and headstock included). These guitars cut into the sales of both Gibson and Epiphone Les Pauls. Gibson hoped to get a large part of that market back. So using their Kramer brand Gibson designed a Les Paul that looked like an ESP EC1000 Deluxe. 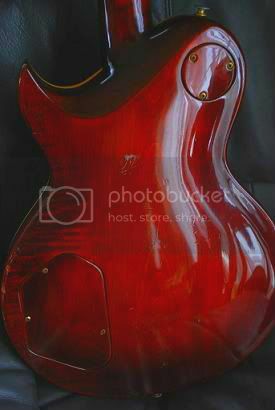 It was as ornate and shiny as the ESP's, but had the thickness of a Gibson Les Paul (the ESP's and LTD's are thinner). 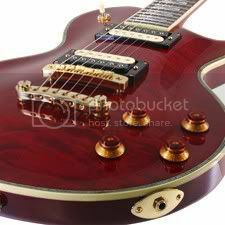 It's a solid guitar - very much a Les Paul in basic design, just more opulent in it's decoration. Sound wise the Kramer Custom (as they would be named) is big, fat, crunchy, and very similar overall to what players (and music fans) have come to expect from a Les Paul. These are some fantastic guitars. And after two years Gibson pulled the plug. 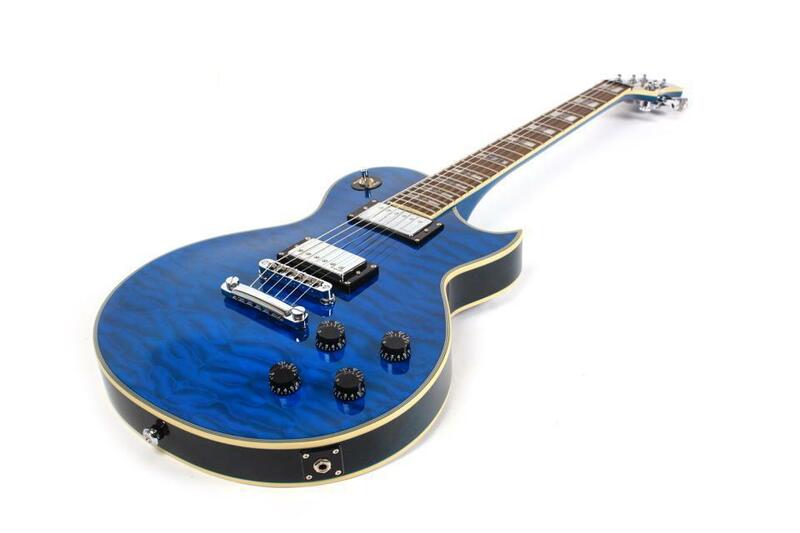 Not because they didn't sell well, but because their market research showed that instead of taking a big bite out of the ESP LTD line they cut into Gibson's own Epiphone Les Paul line! They were taking sales away from themselves, so despite the quality of the guitars and the acceptance in the market Gibson put an end to the Kramer Custom. There are still a few floating around, but they don't come up for sale very often as Kramer Custom owners typically won't part with them. For many players (and collectors) the Kramer Custom has become the Holy Grail of guitars. This is a model that comes highly recommended. Of course, no discussion of Les Paul type guitars would be complete without official Les Pauls. Gibson Les Pauls are well known for their tone and classic good looks, but less known is the fact that Gibson's budget line of Les Pauls from Epiphone are also very good (some, to the surprise of many, are as good as most Gibsons). 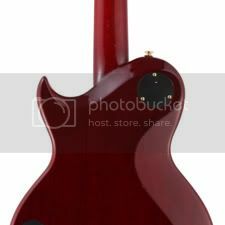 Epiphone Les Pauls have gotten a bad rap due to the lower end of their line. Many of their cheap bolt-on neck models often have issues with staying in tune and come with poor electronics and mediocre pickups. Even their higher end models had some lackluster pickups for several years in the 90's and early 2000's. But the construction and workmanship of the Customs and the nicer Standards was quite good, and when Epiphone introduced their Elitist line they took their quality into the realm of guitars that sold for 2 or 3 times as much. The Elitists were made in Japan, where some of the finest guitars of the last 40 years have been made. The specs were equal to the Gibsons (solid maple cap, long neck tenon, better finish, better pickups, better electronics), and the workmanship was just outstanding. Shortly after introducing the Elitist line, Epiphone introduced their Probucker and Alnico Classic pickup lines, and suddenly even mid line Epiphone Les Pauls sounded amazingly close to the Gibsons. 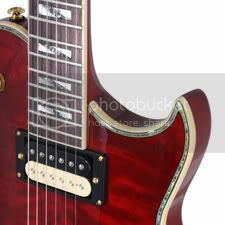 The workmanship on the Standard, Traditional, and Custom lines, along with signature models for players like Joe Bonamassa, Matt Heafy, Tommy Thayer, and Bjorn Gelotte, was far better than the Epiphone reputation said it should be. And the Tribute and Tribute Plus models were probably the best bargain in the Les Paul market with quality coming close to the Elitist line. And special mention should be made of the groundbreaking Prophecy Custom Plus line with their slim, 24 fret neck, phenomenal finishes, and either Gibson 498T/490R or EMG 81/85 pickups. The biggest difference between the Gibsons and the Epiphones is in the source and grade of wood used. 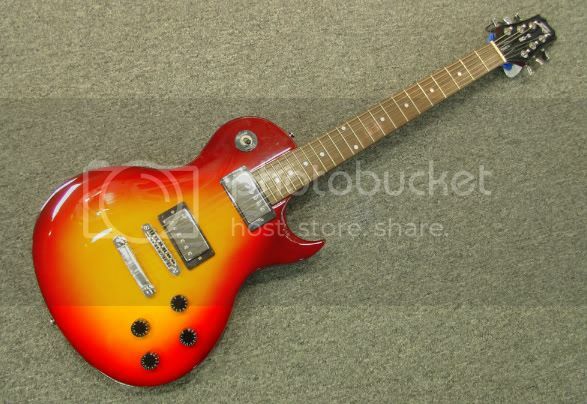 But at 1/4 the price for the corresponding Gibson models the Epiphones are a fantastic bargain. Made at Japan's famous Fujigen factory. The attention to detail is excellent, and the playability and tone is phenomenal. They may just be the all-time best value (and biggest bargain) in Les Pauls.